Nails are excellent indicators of disease and provide diagnostic information. Ingrown nails- Result from an alteration in the proper fit of the nail plate in the usual nail groove. Sharp edges of the lateral nail margin become driven into the skin of the nail groove. The nail essentially becomes a foreign body. An inflammatory response occurs in the involved nail groove. This can lead to redness, swelling, drainage, and development of granulation tissue. Onychomycosis- Fungal infections are common, usually caused by dermatophytes. Common causes: T. rubrum, T. mentogrophytes, and E. Floccosum. Anonychia- Is the complete absence of the nail. This condition is a rare congenital anomaly. Paronychia- Is an infection usually accompanying ingrown nails. Beau’s Lines- Transverse ridges in the nail plate. Clubbed Digits- marked convexity of nails, with the nail becoming hard, and thick. Eczematous Conditions- Many types of eczematous dermatitis such as atopic and contact dermatitis can affect the nail folds. Glomus Tumor- A purplish tumor that causes pain. The nail bed will appear as a blue-red distortion. Koilonychia- This describes a spoon shaped nail and describes a characteristic deformity in the form of a concave shape. Onychauxis- This is the thickened, elongated, raised irregular nail. Onychogryphosis- Is an exaggeration of onychauctic condition. Onychomalacia- Refers to softness of the nails. Onycholysis- Detachment of the nail bed from the overlying plate creates a space between nail plate and nail bed. Splinter Hemorrhages- These are caused by capillary fragility in the longitudinal vessels of the nail bed. The matrix- is a stratified epithelium that produces hard keratin. The proximal matrix forms the superior nail and the distal matrix forms the lower nail. Nail plate- can be separated into zones with predominantly different beginnings. 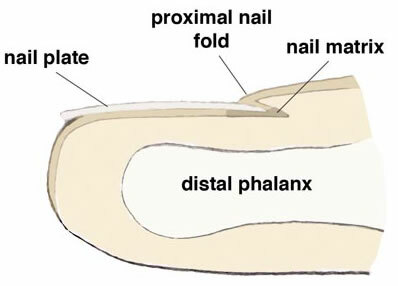 The uppermost layer is generated by the proximal nail fold, the plate by the matrix, and the deepest section of the nail plate is contributed to by the nail folds and bed. Lunula- is a white semi-lunar area corresponding to the anterior matrix. Nail bed -consists of the hyponychium and corium over the matrix. After the toe has been anesthetized, a portion or the whole nail is removed after a sterile preparation of the toe. Next 3 applications of phenol are used at the level of the matrix. The phenol is used to destroy the tissues of the matrix which will prevent further growth of the nail. The area is then flushed with alcohol and a dressing with antibiotic ointment is applied. The patient is given post operative soaking and dressing instructions. Is a process similar to the phenol and alcohol chemical matrixectomy but uses sodium hydroxide and acetic acid to neutralize. The same criteria apply as for Phenol-Alcohol procedure.